Balsam Hill's 48-inch Berkshire Mountain Fir Artificial Christmas Wreath complements our Berkshire Mountain Fir Christmas tree. Its 100% medium-long Classic Needles feature light-green and grass-green hues for subtle depth, while light-brown stems and tapered tips provide hints of realism. Pre-lit with optimized light count and bulb brightness, its clear lights are professionally hand-strung to reduce the appearance of wires. 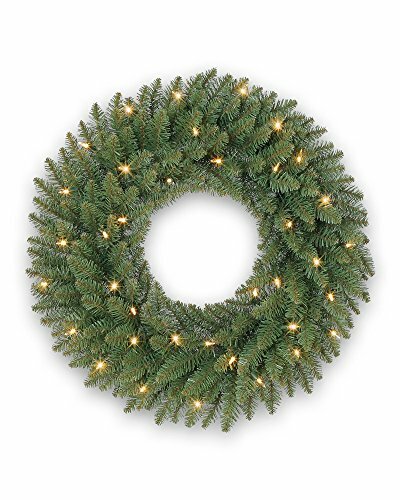 Built to last and beautifully constructed, this artificial Christmas wreath will decorate your home for years to come. This wreath is compressed for shipping in order to keep the package size manageable. This product will require some fluffing to achieve the fullness of the image pictured. Balsam Hill is committed to providing our customers with a picture-perfect holiday. From beautiful artificial Christmas trees and matching wreaths and garlands to heirloom-quality ornaments and inspired home décor, we help you put the finishing touches on your home during the holiday season and beyond.